Novak Djokovic is on a whirlwind of a comeback. He may not be my favorite player ever, in fact, I can’t really stand him, you still have to respect what he’s done. A couple of years ago, Novak was on top of the tennis world. He had accomplished things that neither Federer and Nadal hadn’t accomplished yet. 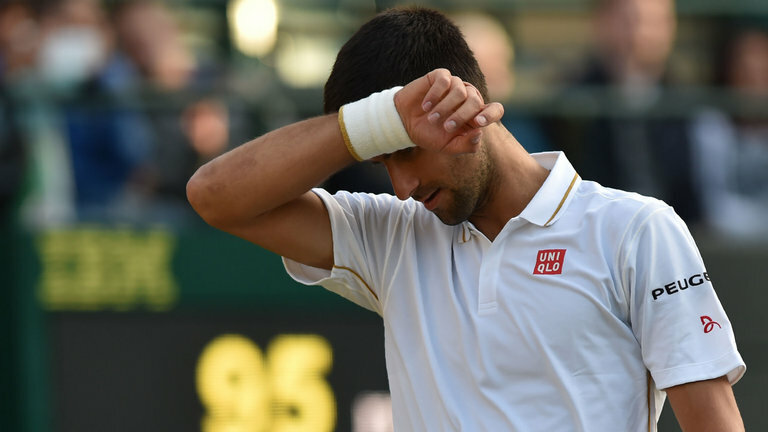 Djokovic suffered a “surprising” loss to Sam Querry in the round of 32 at Wimbledon in 2016. It was surprising because it was near impossible to defeat Djokovic for over a year. After that though, it became a much more common thing until Wimbledon 2018. Djokovic was struggling to find his mojo. He was looking everywhere he could look to find the answers he was searching for. He changed coaches, brought in a shaman, completely changed up those close to him. Before the French Open this year he did something that really made a difference. He brought his crew back. He after going through some troubles, Djokovic went back to what made him successful. You could start to see that he was a different play, yet again, at Roland Garros until he had a meltdown. He didn’t let his terrible time since 2016 trouble him though. He knew that he still had the tennis in him to compete at the top level. At Wimbledon, that tennis came through. His semi-final with Nadal was incredible and had to have lifted his spirit and confidence. It seems like this would be pretty simple, but Djokovic keeps the ball in play. That’s his superpower on the tennis court. Just like the players he through time he is compared to, his number one talent is speed. Djokovic has the uncanny ability to get to just about every ball. What causes others problems with that is that he gets the ball back with a purpose. The majority of shots that come off Djokovic’s racket are still forceful or neutral enough to keep an opponent off-balance. In the US Open final against Pel Potro, the Argentine hammered forehands all over the court, and Djokovic was still able to get to them and return them. Often times, he was able to even redirect the ball to the open court. So what can we get from this? Lesson #2: Get the ball back. If you can increase your speed and footwork, it gets much easier to get to the ball. Too often with recreational players, they give up on a ball because they don’t think they can get to it. Make an effort. I tell my students all the time that you don’t know if you can get to a ball if you give up. If you try you might be able to do something with it. Lesson #3: When you are playing someone that hammers the ball, don’t try to outhit them. Get smarter. Djokovic was great at redirecting the ball to the open court against DelPo. He didn’t try to out hit him, nor did he try to do just get the ball back. Try to use your opponent’s pace against them. If you can take the ball early and use your opponent’s pace, you can wear them down! You don’t have to like someone to respect them. If you use these tips and practice them, you can take your game to the next level. All it takes is hard work, belief, and some good tactics. One of the toughest things in our sport is improving a shot or stroke that you’ve been working on when the chips are down. Usually, the way that you’ve hit that shot for so long has been ingrained in your body. When you’re in a pressure situation, your mind can go on auto-pilot and you go back to the old shot. So how do you change that? The first thing you need to do is start slow. Don’t be scared or surprised to miss. You are learning something new, and need to take a thousand swings to learn the new motion. Right now, you are trying to get a feeling for the change with no pressure. The more you can practice the shot in a low pressure situation, the better you’ll be in the long run. If you are working on a groundstroke or a ball that you would hit in a rally try to start slow and get someone to toss or drop you a ball. Decide what a good success rate will be with the easy feed and move from there. A good number might be 8 or 9 out of 10 tosses. This sets a standard for success and gives you direction for practice. Once you have hit your goal, start to add in more. Have someone toss the ball so you have to move more, or have them toss it so that you can add more shoulder turn and power. The more you can master the stroke in this phase, the better you’ll be down the road. Have the feeder move to the far side of the court and start to use their racket. The feed will become more like a real shot, and it should take a few practice swings to get the right timing down. Again, work with a goal in mind. still trying to get that 8 out of 10 balls would be a great goal. You want some pressure and you want to focus on something and not just be out there swinging with no goal. Once you’ve got a feeling for the shot, it’s time to start making things just a little tougher. Get a friend and start to rally. If you are focusing on a particular shot, have your partner focus most of the attention on that shot, but don’t hit 100% of the shots there. You need to be able to hit something else and then return to it. Still, you want to start making it more like a real point than someone feeding you. Set a goal: rally with that topspin forehand 10 times in a row, alternate forehand and then the backhand slice that you’ve been working on. Something to make it almost like a point. You need to start putting pressure on the shot now. It will break down. You will miss. This is where you are fine-tuning the shot. You are getting used to it. There needs to be more pressure than before, but not the pressure of a match situation. Once you’ve got a feel for it, start to play out points. It can be drop hit or tiebreaks, or even a real set. It’s time to put some pressure on the shot. Your shot will probably break down, and that’s okay. Playing out points and keeping score puts different types of pressure on you than just trying to rally and get used to a shot. See how your shot puts up with pressure, look for what happens when it goes wrong. If something happens consistantly, like hitting the fence, go back to the last step or even the first step and fine tune it. This is where things start to get real though. Players, when put in a position where winning and losing is on the line, begin to return to things they’ve done before. You need to change the attitude here. Success is trying the new shot, not winning the point. Don’t think that winning these games, these points mean that you’re improving if you aren’t working on the shot. Winning the point with the old shot or strategy isn’t really improving the shot. If you were losing because of your crappy backhand before, and you just won a point using the same backhand, how are you going to move forward? Once you are starting to hit the shot successfully with a pretty good consistency, it’s time to start pushing even further. The real test begins. Practice is over and it is you versus an opponent. Here is where all the practice pays off. If you followed the steps above you should have developed some confidence in your new shot, but will you be able to use it when the pressure is at its greatest? Keep your focus on improving the shot, not winning matches. You should be looking to the success in the future, not the success in front of you. In 2016 when Roger Federer took half a year off of the tour, he decided to really work on his backhand. So he took to the practice court. When Federer returned to the tour in 2017 and started to hit is new backhand, many of his coaches marveled at it. They had all suggested some tweaks, but not having time to really work on it because of the grueling nature of the tour kept him from really being confident of the changes on the tour. Annacone, now a Tennis Channel analyst, said he never had any doubt that Federer could execute a more aggressive backhand; the question was whether he would remain committed to it at pivotal junctures. So hopefully everything that you’ve worked on will carry with you. You have to commit to that new shot. You need to risk using that new shot when the pressure is on, and not be scared to lose. So to improve, to become a great champion, don’t get caught up with the wins today if you are working on something. Worry about learning and improving now, so that in the future you can become a champion. Everyone wants to win. All of us would probably like a way to win even easier if we could, but so many of us are so scared to work on parts of our game, or even change things up. The current professional game is going through a major change right now. For the past ten years or so, the pro that had the better defensive game would win most often. Nadal has made his fame playing defensive to win The French Open a staggering eleven times. Condensing that down to the game of us mortals, the person that could get to more shots and place them back without missing would win. Or get one more ball back than your opponent. Now though, things are changing. While it is and always will be important to have great defensive skills, the player that is more aggressive with their footwork and moving forward will have the advantage. According to Pete Bodo at ESPN. more players seem focused on pre-emptive ball-striking and offense. More pros are going from defense to striking hard and moving, so what does this mean for me? And how do I use this to win the points easier? That’s the more difficult part, but it’s not that hard. It just takes some practice. Step one is to work on your defense. Getting more balls back in play will on help you. But don’t just get the ball back, try to be more forward thinking with your plan. As you get pulled wide, instead of just getting the ball back in play, work on countering your opponents positioning. If they stayed where they are, try to hit the ball where they’re not to get them moving. If they seem to have everything covered, throw the ball up high and give yourself more time to get back. Once you’re able to get more balls in play, work on controlling the point from the first couple of shots. Use your serve to set up your oppoent off the court to use your strong forehand down the line. Try to return a serve in a way that will get the server moving from the first shot. If you can do that, you should be able to take control of the match. If you can get your opponent moving more than you, their battery will eventually drain and you’ll be the fresher player. You don’t have to be a great volleyer, but working on your net game can help you finish off a point quickly. Once you start to control the point, and you get your opponent moving, you need to start looking for chances to move forward. If you can manage to get your opponent off the singles court and into an alley, moving forward and looking to volley can take time away from them to get to the next ball. Plus it makes that volley a heck of a lot easier to hit when you have half the court to hit into. Many players are afraid of the net because they don’t have as much time to prepare their shot, or they try to do too much. If you get your opponent off balance before you come in, you can usually get a weaker shot hit at you. Also, if your opponent is off the court, there’s less pressure to hit the volley in a tiny area. This usually leads players to being more succesful at the net and helps them get used to being up there. Next time you serve on the Ad (left) side of the court, aim your serve out wide. The goal here is to get your opponent off the court on the first ball. By doing this on the Ad side, you will most likely be hitting to their backhand, which is usually their weaker shot. If you manage to get your opponent out into the alley to return, aim your next shot (try to use your strongest groundstroke) to the other side of the court. Get them moving. And try to take the ball early. If you can take the ball right off the bounce, you’ll be in a better position and your opponent will have less time. Follow that ball in towards the net, and if they are able to get a racket on it, you should have a wide open court to place your volley. You don’t even have to try to hit a winner, just put it across the court, back where they returned from originally. If they get that ball hit it back to where they were before that last shot. Keep them moving. If they start to anticipate you making them move like a yo-yo, then you hit behind them and really confuse them. If they manage to win the point, you just made them run about 4 times as much as you did in the point. Keeping this pattern up will run them down and make them run out of energy. Look to be aggressive and move forward to control the point.